When you are trolling the net doing research you never know what you may find and then you find a diamond in the rough. This is where the introduction to Black Mercies from Portland Oregon begins. After listening to some of their stuff online, a simple email was sent to the band letting them know that they had a great sound. The band's story starts when they were doing some incredible studio session work for other bands and other commercial ventures. It was during 2006 that the bass player Colby decided to hell with helping others sound great, we will just do it ourself and form our own band, which is what he and drummer Storm did. 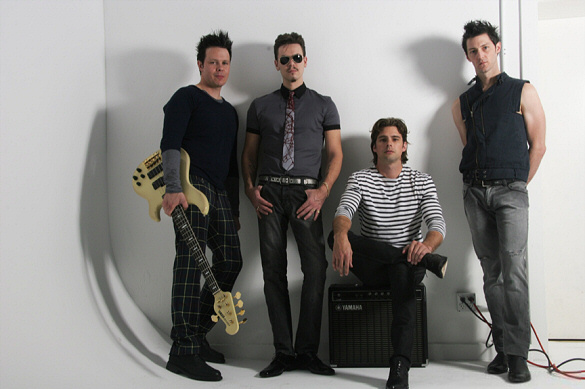 Bringing Caleb in on keys and then in 2007 they found singer/guitarist BB on Craigslist, it was then that the current line up was formed. Although for a brief period prior to this line up they were a 5 peice band until it was decided that a 4 peice just made better sense to the sound and structure of the band. Their sound could be best summed up as the best elements of U2 from 80-83 with the vibe of The Cure and Echo and The Bunnyman mixed in. It is this mixture with their own Indie style that makes this band so infectuous. Then to our suprise we get a wire from the band that they will be in Los Angeles for a few dates, so we knew that this would be our chance to see if they were everything that they were on their CD, yet in a live performance. One of our photographers was available and went to catch their show. When we transcribed what was written on the quad folded piece of paper he took notes on, these were some of the comments that were written: "Stage presence was very confident without being pretentious - Vocal range is phenomenal - Very bold sound - I had to go look at the sound board to see if it was it live or was it Memorex, the sound was such a match with the sound on their CD, I had to check to make sure - These guys are the Real Deal." 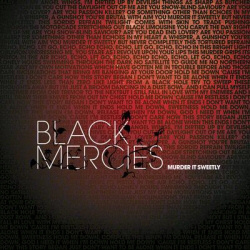 It is our impression of Black Mercies that they are seriously destined to go on and do some very big things in their career. When that stepping off point does finally occur, many will remember that they read about it in Big Wheel first. Consider yourself tipped off, go see this band now so you can say you saw them play before they hit. The band's first release, Murder It Sweetly is out now with 8 tracks on it to get you started.